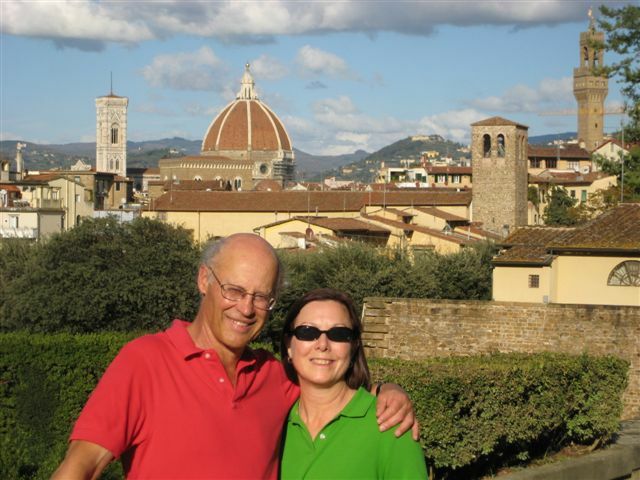 When we were visiting Mike and Liz at their ranch in Corning, they told us about a flea market in Orland. Orland is on I-5, about 14 miles south of Corning. We left Corning to head to Dublin and stopped at the Orland Flea Market on the way. There were a lot of different fruits and vegetables available; we got some poblano chiles, avocados, radishes, and limes. 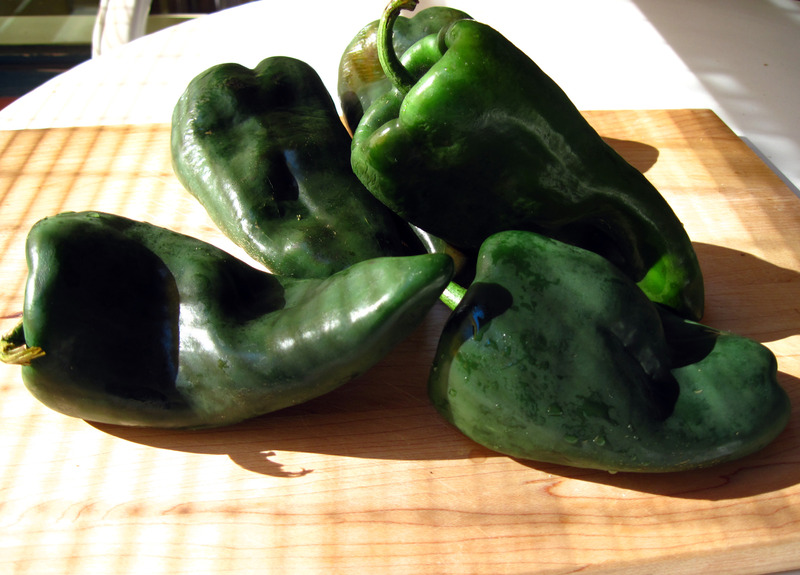 We ended up carrying 5 poblano chiles five more days on our road trip. Fortunately, they were very fresh when we bought them and they survived the trip just fine. 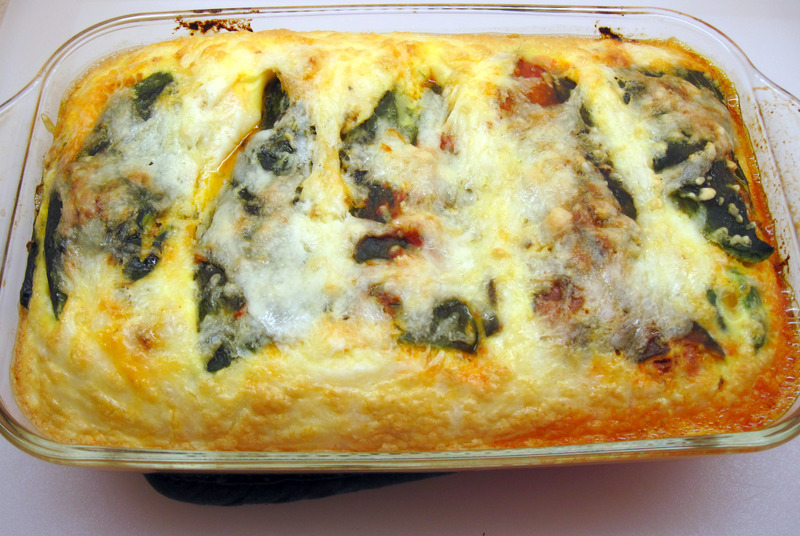 Last night I decided to make a Chile Relleno Casserole with Chorizo. I adapted a recipe by Elise Bauer on Simply Recipes. Since Elise lives in the Sacramento area, I figured she would know a thing or two about California peppers! 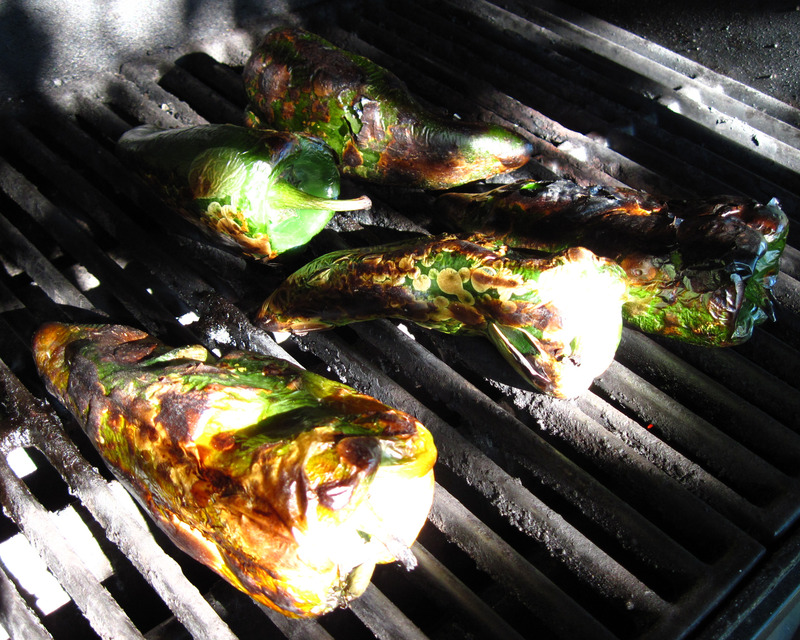 I had never used fresh poblano chiles before, but Elise gave very simple instructions for charring them to get them ready for the recipe. I used my gas grill, but you could use your broiler if you don’t have a grill. Elise’s recipe uses 8 chiles. Since I only had 5, I adjusted the amount of the other ingredients and baked it in a 2 quart (7”x11”) baking dish. It was perfect with some fresh Yakima corn which I quickly cooked “Minnesota style”. 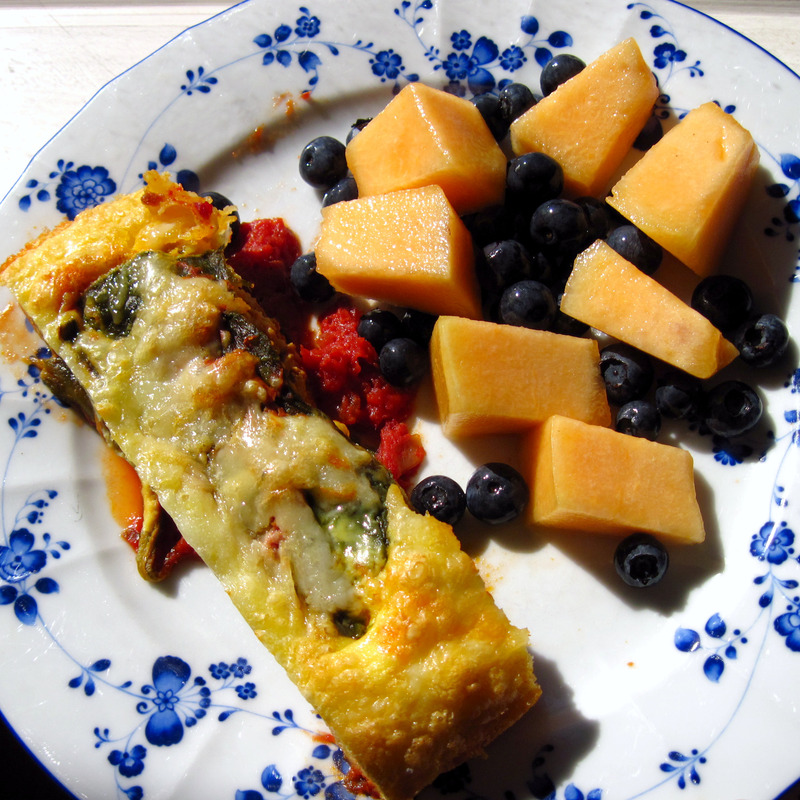 This morning I heated up 2 leftover chiles and served them with cantaloupe and blueberries. 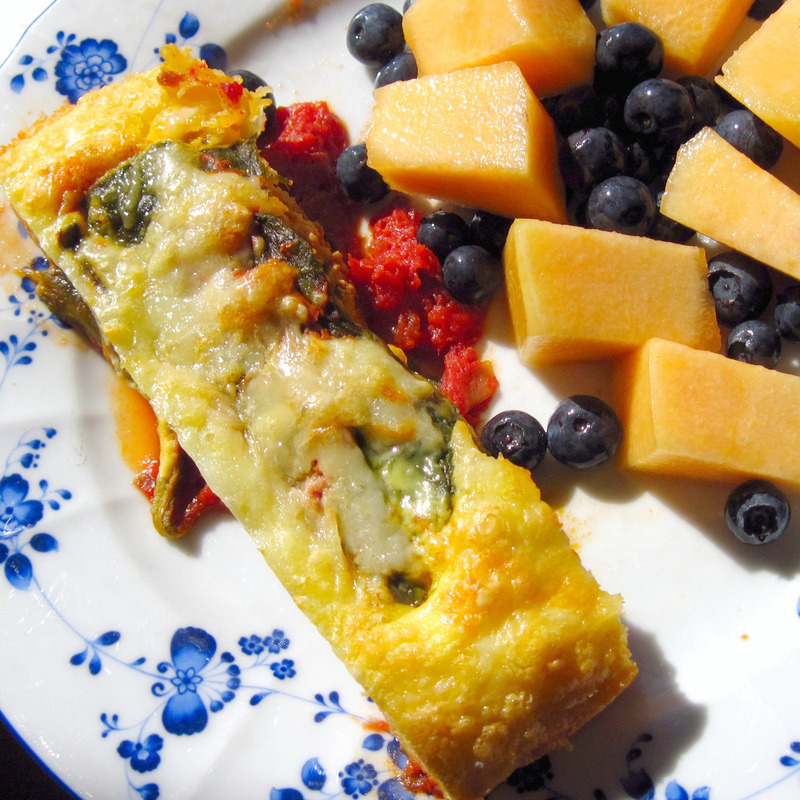 It was a fantastic breakfast for a hot Sunday morning. 1. Heat a gas grill (or broiler) to high. 4. Preheat the oven to 375˚. 5. Heat the oil in a large skillet and add the onions. Cook, stirring occasionally, until softened, about 5 minutes. 6. Add the garlic and cook, stirring, for about 1 minute. 9. Peel the blackened skin off of the chiles. Cut the tops off and make a slit down the side so you can open them up. Remove the seeds. Set the chiles aside. 10. Using the same pan that you used for the tomato sauce, cook the chorizo over medium heat. Break it up into small pieces and cook until done, about 4 minutes. 11. In a large bowl, combine the chorizo, ¾ cup Monterrey Jack cheese (or cotija), and the oregano. 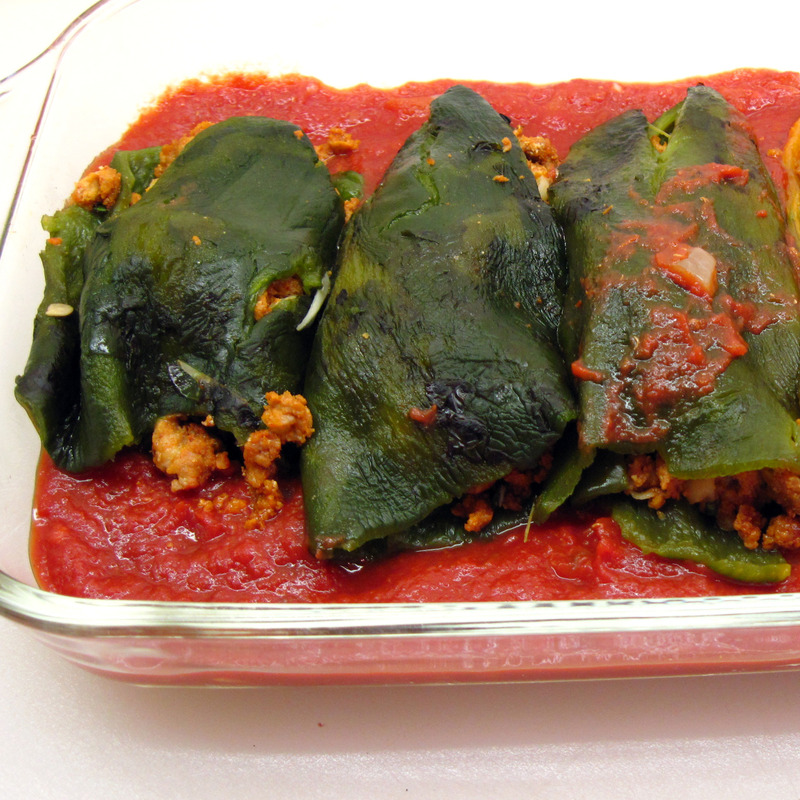 Stuff the chiles with the sausage and lay them in the casserole. 12. In the bowl that you used for the chorizo, beat the eggs well. Beat in the flour, baking powder, and a pinch of salt until well-blended. 13. Sprinkle half of the remaining cheese on the chiles; pour the egg mixture over all. Sprinkle the top with the rest of the cheese. 14. Bake until done, about 30 minutes. Let it rest for about 5 minutes before cutting. Hi, Kath. 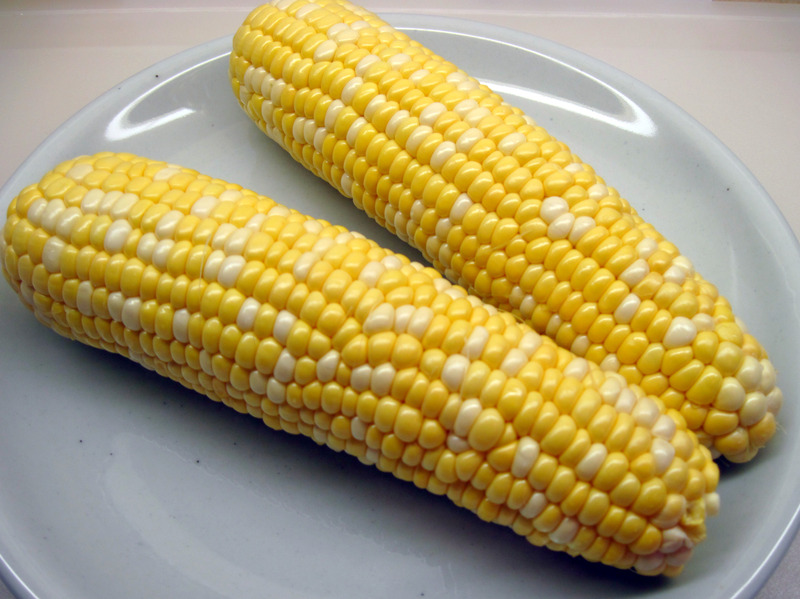 I like the idea of chile rellanos without the deep-fried breading – and using local corn (our equivalent, just north of the border, is Chiliwack corn, which looks like the Yakima peaches and cream variety). Very good post! Thanks for your comment, Dan! I have had corn from the Chilliwack area, and it really is exceptional! This looks good, love this kind of dish! Thanks, Patty! We enjoyed it; I know I’ll be making it again. It really is wonderful, Mary! I think one of the secrets is starting with good peppers! 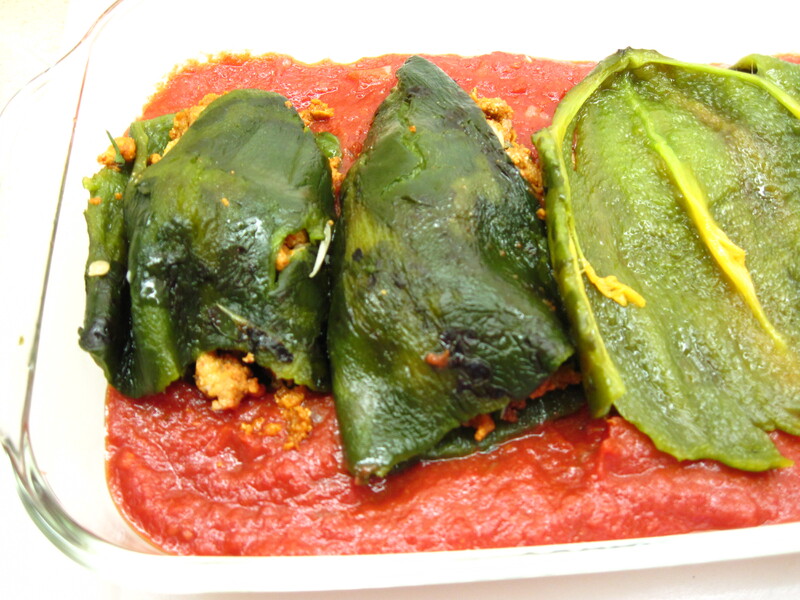 I love chile rellenos. What a great idea to turn it into a casserole! Thanks for the recipe. Just found this recipe this afternoon, while trying to can WAY to many veggies. Recipe looks awesome and amazing. Made the sauce from fresh tomatoes, garlic and everything else from my garden. Even my own cheese. Will tell you how it all tasted.